Ask anybody! Chapter 240 has a reputation for serving excellent breakfasts. 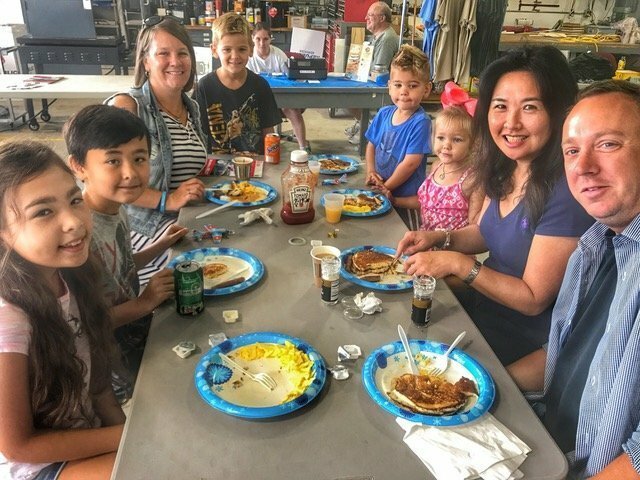 We host five Pancake Breakfasts each year, rain or shine, and these attract many pilots and aircraft from around the region and beyond, plus a strong contingent of local supporters. Breakfasts are cooked and served hot and fresh at the EAA Chapter Hangar at New Garden Flying Field (N57), and we serve from 8am to noon. Come for breakfast, see the aircraft under construction at our hangar and enjoy this unique and people and pilot-friendly airport. We look forward to seeing and serving you! On several of the dates (above) we also offer Young Eagles – Free Flights forKids. Please see our Young Eagles web page for more details. Our ‘Increasingly Famous’ Breakfasts include fresh pancakes, eggs (cooked to order), potatoes and sausage. Coffee, tea and orange juice are included in the charge, half-price for kids under 12 years. Our breakfast is $7. The income generated supports our annual Flight Training Scholarships (more information here), maintain our hangar and other operating expenses (EAA240 is a not-for-profit organization). Thanks for your support.